When I was a kid, we Carters didn't have Grand Theft Auto. We had slot cars. Just like in the picture. Two little electric cars, guided along their paths by tiny plastic pegs and fuelled by hand-held wired remote controllers, raced around the track until they crashed or we got bored, whichever came first. 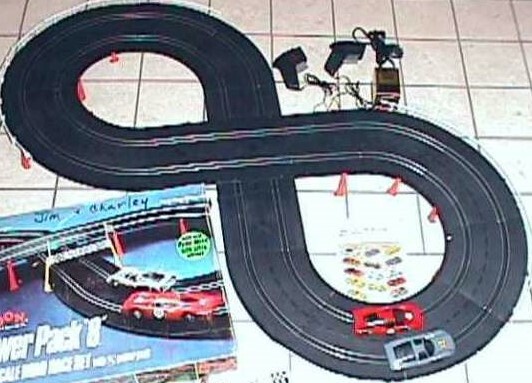 For us young Carters, the slot cars delivered minutes and minutes of fun. Of course when I say "we had slot cars" I mean "my older brother Eddie had slot-cars." I'm pretty sure it was Ed Santa brought the racing set to. But because I was the baby of 10 and spoiled so rotten my teeth were brown, I thought every thing in our house belonged to every body in our house. Toys, boots, candy, longjohns, you name it. We shared everything equally. Or maybe it was just me. One of these days I'm going to survey my brothers and sisters to see if they felt as generous with their stuff as I did. It's true about the brown teeth though. My baby teeth---and this might be linked to the fact that my mom and dad allowed me as much sweets as I wanted--came in crooked, sort of "fangy," and darkly off-colour. Pretty attractive huh? Get this: One of my childhood nicknames was "Golden Snags." Imagine. Teasing a youngest brother because of a physical deformity. That's the kind of older siblings I had I mean still have. It's a miracle I turned out so well. Another of my nicknames? "You Little Squirt." A third? "Little Hitler." I got called that, too! But back to the slot cars. As high-tech and advanced as it was, the toy had limitations; so early on Eddie figured out that if you removed the little white guard rails from the edge of the track, the risk of the cars flying over the side got way better, so off came the guard rails and wheeeee! off flew the little racing cars. 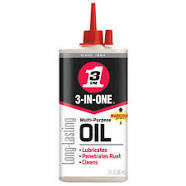 Eddie also--in an effort to make the racing cars even more dangerous--squirted 3-IN-ONE oil on the track to make the surface virtually undriveable on. I looked up to my older brothers and sister then and now and wonder how they put up with spoiled rotten me. Not only were they all generous, sharing, daring, bright and adventuresome, the Carter kids had superb timing. I remember one time out in the yard playing cowboys. I was the villain and I'd done something real bad and had to be hanged for it. And--true story--the rope was looped over a tree branch, the noose was around my neck and everything. I was about to pay for my crimes. But mere moments before I met my maker, lucky for me, out came Mom to call us in for lunch. Just in the-- ahem--neck of time. How much fun is that? We laughed and laughed. But something just occured to me. You don't suppose that...naaaah...couldn't have been.